Like Trudeau, Premier Clark will approve Kinder Morgan. Here's why. Like Trudeau, Premier Clark will approve Kinder Morgan. Here's why. Like Trudeau, Premier Clark will approve Kinder Morgan. Here’s why. Industry backers have donated at least $720,000 to ensure Trans Mountain’s provincial approval. From the National Energy Board and the Ministerial Panel reports, we know science and the environment were mere footnotes in this decision. We know both the NEB and Ministerial Panel ignored key safety concerns, including those posed about serious fire hazards and completely inadequate spill response. We also know approval wasn’t based on social licence – our communities did not give consent to this pipeline. So why did the federal government grant permission — and permits — to the Texas-based pipeline company? Nobody can accuse Kinder Morgan of not working for it. Between meetings with Ministerial and PMO staff, including multiple visits to Trudeau’s right-hand-man Gerald Butts and Natural Resources Canada staff a few weeks in advance of the Ministerial Panel report, they put their time in. In fact, Kinder Morgan met with federal representatives – Ministers and staff – a whopping 368 times in a five-year period. They specifically met with the Ministry of Natural Resources, responsible for creating the “unbiased” Ministerial Panel and modernizing the NEB, 107 times. With this much access to key decision makers, it’s no wonder Kinder Morgan was able to wedge their agenda into our government’s action plan. Voters like you and I couldn’t get that much face time with our representatives, let alone the Prime Minister’s top adviser and confidant. 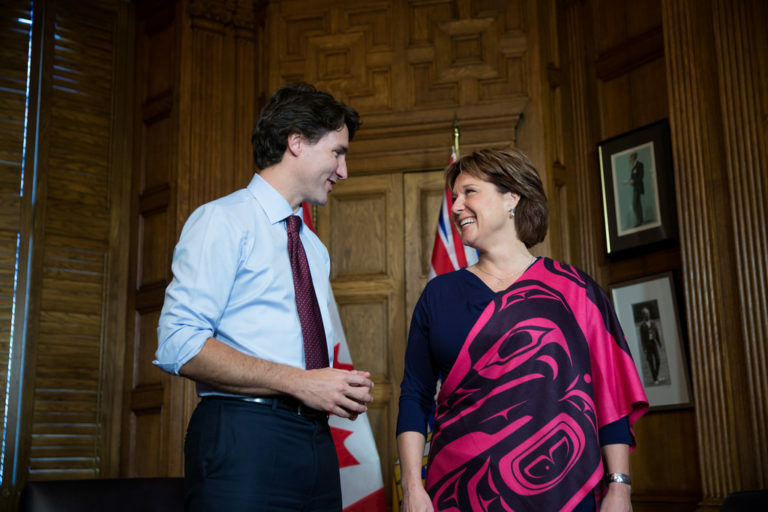 So now that Ottawa has shown its cards, all eyes turn to B.C and Premier Christy Clark – the next political roadblock for Kinder Morgan. Right now the decision is in the hands of B.C.’s Minister of Environment and Minister of Natural Gas. As it did with the federal government, Kinder Morgan has worked the province from all the angles available to big corporations with endless lobbying budgets. During the past five years, the company has formally lobbied provincial representatives 458 times. At the top of their itineraries were meetings with the Ministry of Natural Gas and the Minister of Environment. How convenient. But it doesn’t stop at meetings. Due to B.C.’s Wild West donation laws, companies — even foreign-owned ones like Kinder Morgan — can literally buy influence with their corporate chequebook. Taking full advantage of this, the Texas-based company has donated more than $33,000 to the BC Liberals. This makes it pretty difficult to find any further donations, as they are no longer attributed to “Kinder Morgan” or “Trans Mountain”. This self-regulation of donations is not because monetary persuasion does not work. Clearly Kinder Morgan has figured out the key to catching Premier Clark’s ear, as well as a way to hide their wheeling and dealing from the public by no longer contributing to the BC Liberals under the company name. But before that, the donations followed a pretty damning timeline. On April 30, 2014, Trans Mountain wrote a cheque to the BC Liberals for $4,000. In April 2014, Kinder Morgan also held lobbying meetings with provincial government representatives about Trans Mountain. We don’t know what exactly was discussed at those meetings, but that month it was announced that Kinder Morgan was planning to drill right through Burnaby Mountain. In September 2014, the company wrote a cheque to the BC Liberals for $4,500, then received permission to start an intrusive survey on Burnaby Mountain. A couple months later, in November, when the Burnaby Mountain standoff was at its peak and protesting residents were being arrested, Kinder Morgan again lobbied the provincial government about its plans for Trans Mountain and, you guessed it, wrote a cheque to the BC Liberals. Money and meetings. Kinder Morgan knows how to get things done. But these numbers only tell half the story. Kinder Morgan is an oil pipeline, meaning it serves customers who want to transport their products from the tar sands to international markets. Thirteen shippers have signed on to use the pipeline expansion, including Nexen, Devon, Canadian Natural Resources Ltd., Cenovus Energy, Imperial Oil and Suncor. This is where it gets really interesting. More than half of these oil producers have donated significantly to Premier Clark’s campaign coffers. Chinese-owned Nexen has donated $58,696 to the BC Liberals and, for insurance, $6,000 to the BC NDP. Devon has given the BC Liberals $75,805. Canadian Natural Resources Ltd. has given the BC Liberals $171,480 and the BC NDP $5,500. Cenovus has donated more than $85,400 to the ruling party and Imperial Oil has also donated $111,790. Suncor has given more than $48,000 to the BC Liberals and $6,850 to the BC NDP. Most of these companies donated in 2015, after Kinder Morgan’s self-imposed “ban” on political donations. On top of their generous political donations, Suncor, Nexen, Cenovus and CNRL have also lobbied provincial office holders. In September 2015, Suncor flew to Victoria with the explicit purpose of promoting Trans Mountain. That same month, Suncor donated $2,250 to BC Liberal campaign coffers. In October 2016, a month before the federal approval, Suncor again met with provincial government officials. Of course, Kinder Morgan’s lobbyists were busy in Ottawa at the same time. The Canadian Energy Pipeline Association has had a number of lobbying meetings with the province as well. Reasons for these included discussing “pipeline development” and, after October 2015, “social licence to operate in communities”. Fair enough. It is the Association’s job to advocate for pipeline development. But I’m willing to bet those lobbying discussions specifically included Kinder Morgan’s expansion. After all, Kinder Morgan Canada’s President, Ian Anderson, was for a time the chair of the CEPA board — and the guy in charge of signing the donation cheques. He remains a CEPA board member. When Anderson was in charge of the CEPA bank account, more than $15,000 was donated to the BC Liberals. After Anderson was replaced as Chair, donations from CEPA stopped. The Canadian Association of Petroleum Producers are also big-time BC Liberal donors, giving the party $112,795 since 2005. All in all, Kinder Morgan and industry bedfellows have donated almost $720,000 to the BC Liberals. And that’s just the money we know about. Without “real time disclosure,” as promised by Premier Christy Clark, we have no record of donations since March 2016. So we won’t know the real story behind the provincial decision on Kinder Morgan until April next year, when the parties file donation reports with Elections BC. In the meantime, most British Columbians are expecting Premier Clark to rubber-stamp Kinder Morgan’s expansion project. And why wouldn’t she? On dozens of issues, it’s clear Clark and the BC Liberals are happy to ignore citizens in favour of the companies willing to grease the palms of politicians. Prime Minister Trudeau approved a fatally flawed pipeline after a few hundred lobbying meetings. Kinder Morgan has spent even more time lobbying provincial decision-makers than their federal counterparts, plus the added bonus of those hefty donations. And, heading into an election year, Clark is not going to bite the hand that feeds her by turning down Kinder Morgan. We need to demand more of our governments, both federal and provincial. Decisions that impact B.C. communities should be made by the people who live in them. Update: The amount included above was calculated with information available at the time. Here is an updated total, based on the BC Liberals 2016 donor records. Go back to your office in Texas Len, we dont want your dangerous pipeline. @Travis Adam Connelly: I think Len was being sarcastic. Every dollar gets equal representation. It’s not representative democracy if the “democracy” does not “represent” the people. Hence the multiple references in the article to the fact that there is no “social license” for the projects described here. In other words, according to this article, the voters don’t want it but it’s coming anyhow. It’s not the voters who are being represented on this topic! Correction: some of the voters don’t support this. They’re the ruling party for a reason. And a representative democracy does not need to adhere to every wish of the people. It’s in place to make the best decisions for said people, sometimes whether they like it or not. It’s the money. But the access and the transparency are fully out of balance with the science based dissenting view. I’d call it democracy representative of Corptocracy. We are not in the loop. How can smart people with young children not see that they are cutting down the last trees on Easter Island? They must believe they will be living on a Different planet…for the Special people. Why is the NDP accepting money from the likes of Nexen which has a long history of worker-abuse? a party that stands for higher principles than that…by not taking corporate hand outs in the first place. There is only one party that doesn’t play that game…even if it’s named after the colour of money. The NDP will work hard to ensure environmental ( climate) protection. And that colourful party has only one MLA, who supported the regressive – environmental endangering – BC Liberal budgets for the first two years of his 4 year term! He also supports the David Black Kitimat oil project with associated pipelines or train delivery and supertankers traversing the length of the dangerous Douglas Channel – with its submarine fault line that has already caused several tsunamis down the Channel. The NDP is not taking a banana to a knife fight – this coming election will see the Liberals with massiive millions while the NDP – which gets almost 80% of its funding from individuals like myself – will also face a colourful party that will likely get full page ads from the Liberals supporting said colourful party as it did in the last provincial election! The NDP – the only party with any hope of defeating the corrupt Liberal regime – has promised to abolish donations from both corporations and unions. Such abolition has successfully occurred federally and in several support – and it will occur in Bc if and when the NDP is elected. Meanwhile perfection is the enemy of the possible. Oh give me a break. Sure Weaver supported Liberal budgets. He was also THE ONLY MLA to try to ban coal exports from the US through our province. He has been the ONLY MLA to be against the LNG industry and the ONLY MLA to vote against legislation that guaranteed tax rates for Petronas for 25 years. By far the most vocal single MLA against Kinder Morgan, and the only MLA who has repeatedly done everything in his power to try and get climate action on the government’s agenda. Plus they’re the only party to actually ban corporate and union donations from entering party coffers. As you said “perfection is the enemy of the possible”. I know for a fact the Greens have tried to brooch cooperation with the NDP to try and defeat a common adversary. Unfortunately that’s gone nowhere. I honestly can’t say which party I despise more the BC LIbs or the NDP. The Libs are easy to despise for many reasons but the self-righteousness of the NDP and their complete back-and-forth on the issues that I care about as a voter make me equally angry. Like I’m all for legitimate criticism of all parties here but let’s keep the rah-rah NDP or bust thing in context. In all liklihood I can’t see the NDP winning so may as well vote for the candidate you like the most in your riding. Our money is green? I thought only US$ were. Shame shame shame on Justin. Put the survival of Canada’s Citizens and its environment ahead of your corrupt $$$$ from these shameless planet destroying derniers!! Corruption and greed at every level. BC Liberals and BCNDP are one in the same. Bought and paid for with blood money. We’ll be voting Green. Our children deserve better than this lot of thugs. Definitely time for a change but who? the NDP’s not much better than the neoliberals and the Greens still aren’t ready. I really miss the old BC (real) Liberal party. NDP minority and the Greens with the balance of power. And how do you expect the Greens to become a viable party if you do not vote for them?What do you see the Liberal party doing now they have power,backing down on the pipeline,backing down on medical marihuana,backing down on the promise of getting rid of “first past the post” voting,etc.No party is ready till we vote for them! Not caring. About the fact that the citizens don’t want this. And two the environment. Why don’t you make a video about this and make it go viral on social media? If we lose the fight to stop these pipelines then I would think the next line of attack would be to both make sure the liberals have such a bad image in people’s minds they will not be re-elected, and more needs to be done to convince those believing oil and gas are a good thing that there are better alternatives. We need to map out all arguments for these pipelines and show how everyone will get what they want through renewable energy production systems, etc. Focusing only on the negative (what we don’t want) will not alone help us achieve our end goal, which I assume is move to renewable energy production, but people need to be shown how that is going to work. I applaud everyone’s hard work on this initiative, but I still think more can be done. I would have weekly videos made showing our progress, who we spoke to and their respsonses, etc. Interview those in government, the pipeline companies, and individuals affected by these decisions. Unfortunately not everyone has time to read long articles, I just think videos have more of an impact and gives a more personal feel to the situation. Excellent response and one I agree with. While people will be angry and upset, like myself, many of us are just so overloaded with all the terrible news and negativity that we read that it would perhaps be a great choice to uplift us with the reality and the possibilities, the jobs that could be created to the benefit of Canada AND THE PLANET by renewal and environmentally responsible energy choices. Pure Greed & corruption … I pray that the people and First Nations of B.C. somehow tie this pipeline lunacy up in the courts for a decade or two.. Does anyone really believe Cdn.polititians, at any level, are actually making the decisions as they relate to corporate investment of this magnitude? Freedom of information allows for publication of active investor’s on a corporations shareholders list. One would be awfully naive not to realize these lists are littered with thousands of elected and appointed public officials names throughout the entire Cdn.political arena. The next time a politician, like Justin Trudeau, campaigns for office with completely misleading and irrelevant issues, like legalizing marijuana, take a second to run it through your mind before jumping on board such ridiculous suggestions. Jughead Trudope doesn’t know what ‘legalize’ means. To all those with misconceptions that you were going to be able to blast funnel joints in the isles of WallMart at your leisure, you were dead wrong. Clark and her government are totally manipulative as they dispense spin to a seemingly gullible public on how great they are for the environment- the current carbon tax of $ 30 a ton has remained frozen for years and recently they have approved a huge LNG project and will no doubt OK the Kinder Morgan pipeline- and there is pretty good chance the good citizens of this province will eat up all the propaganda and vote them back in! Christy Clark apparently believes that a carbon tax is like dropping a coin in the box at church, it somehow absolves her of her sins. BC is plowing ahead with at least three major projects that will vastly increase our carbon footprint, the LNG extraction and processing plants (due to massive leaking of methane which is unavoidable during extraction), the BC Hydro Site C Dam, which in flooding a massive area of forest and farm land will also percolate tons of methane from rotting vegetation, and in cutting down great numbers of trees, which have worked as carbon sinks. That dam, if it gets built, will supply surplus electricity this province has no need for, other than to power the LNG liquidation plants, to which it will be sold at great discount, since it cannot be stored. And then finally, the “twinning” of the Kinder Morgan pipeline, which not only puts everyone along the length of the pipeline and on the coastal shores of BC at further risk of oil (and whatever solvent is used to liquefy and dilute the bitumen tar) spills, with impossible clean ups, but is also supplying raw, low quality oil to off shore companies to refine with little to no environmental regulation, and to maintain low prices on using and burning petroleum based fuels long into the future. Christy Clark, and her “Liberals”, like the BC Chamber of Commerce, have been, and continue to be shills for the fossil fuel industry, for which they are paid handsomely in political donations, and/or “membership fees”, and whatever other benefits come to them. BC Chamber of Commerce massively promotes and supports these fossil fuel and energy projects, since they believe it enhances “business growth” in BC, and since it appears only money talks in this province, boycotting their membership is a first step in demanding those corporations take an ethical stand for the protection of BC on this matter. Its not just the liberals, prior to their entrance on stage’ it was the conservatives taking in this money for fossil fuel approvals. Where are our elected representatives who vowed to protect the environment in their election campaigns? Shocking and angering. Like the idea of videos to let the general public know what is really going on, as mentioned above. Would love to see these ruinous actions shown on a big movie screen (in full colour!) – actual scenes of our earth being destroyed. Can you see this kind of film being shown in libraries all over Canada? I certainly hope we don’t lose the fight or wait for the next election. It may be too late. The First Nations people have shown us the way. A mandatory monthly report by all politicians of what had they done for betterment of people of BC to be compared to mandatory monthly report of what had they done for business and corporations of BC. Following by explanations why was it done when betterment of people was ignored or even suppressed in favor of profits. Who’s surprised at all of this? The previous premier gordon campbell sold off our rivers and privatized our resources- remember? Then surprise! He gets a plumb job as High Commissioner to the UK, living in luxury and having tea with the Queen. For god sakes, vote these people OUT! Kinder Morgen will never get their pipeline through the courts because the Supreme Court will deem this project unsafe for ourselves and our children/Kinder. If it does go through this highly populated area, the first spill will kibosh it like the Exxon Valdez which still is not cleaned up and never will be. The spill in English Bay is still at the bottom of the pond as is the spill further north at Bella Bella after ruining the seafood there. Interesting that the minute catastrophe strikes…there’s a ban on news and clean up because they can’t clean up their mess. People don’t count to these monied bullies. That’s why we have to fight for ecojustice now not later. As for Clark and Trudeau…they are corrupt liars to boot. Vote them out. 1. KM has the WORST industrial accident & fatalities record of ANY company in its segment. Period. 2. Those who can recall the now disappeared ENRON may remember that one of its high executives took his golden parachute and went to Texas, where he bought majority control of… have you guessed?… but you already know: KM!! 3. Please look at KM’s WCB records if you don’t believe me in re the hazards and lack of maintenance. At nearly 74, I’m still fighting these creeps; younger people must step up to replace us, ASAP! google –or much better, use cluuz– my name to get some idea of what I’m about. I agree with you 100% Joseph, I am also 74 and getting tired of trying to convince people to get involved, our future is at stake. There is so much apathy in this country, a lot of Canadians like to complain but don’t want to do anything, as long as we have a beer in our hand and can watch a hockey game we are happy. All thru out Canada they want the Kinder Morgan pipeline to the BC coast, it will create jobs they keep saying, and is in the National interest. Not realizing most of these are temporary, how many jobs and businesses will be wiped out by an oil spill that is guaranteed to happen. And we all know about the clean up ( disaster ) response, it is going to be bad. I don’t know how Trudeau and Clark can justify this project. It will wipe out fisheries, eco tourism, birds and other wildlife including the local Orca pod, and who is going to pay for the collapse of our economy. Your Pipeline is not wanted. It is not if an oil spill happens, it’s when. Please note BC Greens have stopped corporate and union donations. The biggest problem with politics in BC is that the BC Liberals are the only ‘real’ choice. The NDP had a chance at BC and the damage was far reaching and long winded. The economy here isn’t bad, and we only need look at the NDP in Alberta to know what kind of disaster awaits the foolish choice of their economic disaster policies. Alberta was going to suffer with the ‘Oil Recession’ either way, but the NDP has done their utmost to completely decimate the energy industry. What little could have been salvaged with business incentivization was not just ignored but the opposite was enforced and that hat pushed away any kind of oil money that might be available. True to form, they have decimated the oil and coal industries and ensured that no jobs in energy were left. They have tried to create enough public sector jobs but that isn’t enough, and it’s part of why the deficit is so unbelievably huge. So, no, the NDP are NOT a viable option and the Green Party just isn’t a party, it’s a ‘movement’ that isn’t likely to be a party that could run anything, any time soon. The ONLY hope that BC voters have is to force the BC Liberals to fix themselves. Force them to ban corporate donations. Force them to limit donations to $2000 or less, and any donation over $500 to be held to public scrutiny by a non-partisan agency. If it’s found that a larger donation has come from an obviously corporate source (and that’s usually quite easy for any forensic accountant to determine) then it would have to be returned, or better yet, confiscated and used to fund the agency that is scrutinizing the donations. The Liberal party in BC isn’t that bad (unlike the federal Liberals. The are rotten to the Trudeau core) and it wouldn’t take a lot of changes in transparency and limitation of corruption to improve it greatly. THAT it, imho, the only viable option that BC until another more palatable option becomes available.